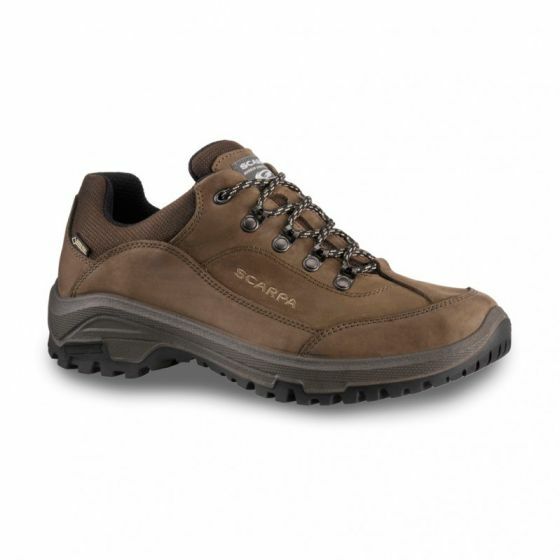 The Cyrus Goretex lined shoe is a classic leather walking shoe perfect for summer trails and travel abroad. The Cyrus is built to be a more relaxed, comfortable shape, perfect to wear every day as well as walks in the country side. The use of direct injection construction means the shoe has a consistent, progressive flex, and the durable PU layer gives long term cushioning and support. The outsole is designed by Scarpa and perfect for use on prepared trails and paths. The soft, supple nubuck leather upper is designed to be comfortable straight away while having a timeless aesthetic. The leather is backed up with a Gore-Tex waterproof lining to keep your feet dry and comfortable all year round. A water resistant Nubuck upper with GTX lining ensures this shoe will keep you dry and protected on the trail or street in our less than perfect climate! The PU midsole has a low weight and outstanding underfoot comfort. The new Scarpa outsole gives plenty of traction for a wide range of underfoot conditions. This is a general guideline, but varies between brands. Vigilante and Birdee are Australian sizes, Exofficio and The North Face tend to be big for the size. We are happy to help you choose your size - just call your nearest store or call 1300 551951.